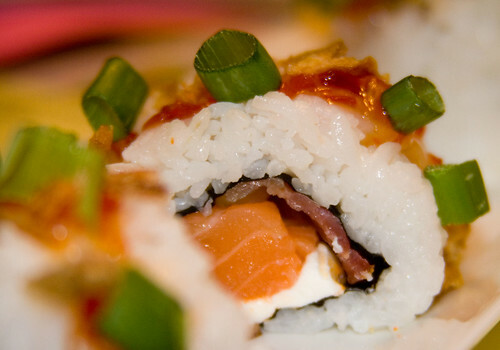 Obviously, if I find a sushi roll involving bacon, I’m going to try to replicate it. Such was the case with the “Hog Tied King” roll from Tex Wasabi’s. 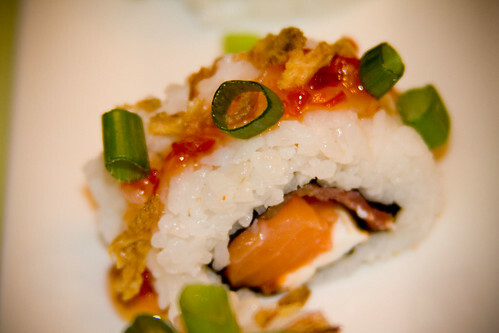 The cool cream cheese cut through the saltiness of the bacon and salmon, and the Sriracha gave it just the right kick. To top it off, the fried and green onions over the sweet chili sauce gave it an unexpected sort of Vietnamese twist – very delicious. Perhaps not the most traditional roll, (but really, it’s not like many of the ones I make are) but certainly a scrumptious combination. Chop the green onions into thin circles. Using a sharp knife, slice the salmon into 1/8 – 1/4 inch thick slices against the grain of the fillet. 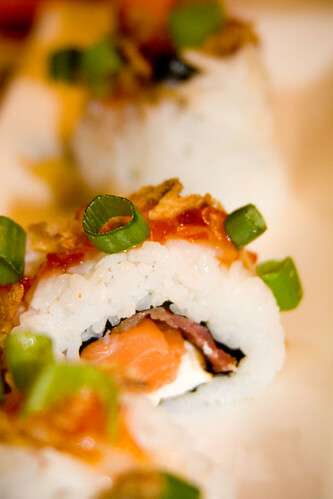 Roll the sushi inside-out, using two pieces of bacon, salmon, cream cheese, and about a teaspoon of Sriracha sauce as your fillings. Drizzle a tablespoon of sweet chili sauce over the roll, then sprinkle with chopped green onions and fried onions. Wait, you’re not going to bring along your favorite commenter’s that have been here since the beginning, as stated in your previous post, as a reward? By the way this sushi is similar to the sushi I make at home…I think I told you about it once. I make cream cheese and melt it a little in the microwave, add some franks red hot to it and you have a nice spicy cream cheese. It goes good with Salmon IMO. Darn-it that looks yummy even though I don’t eat pork. I’ll have to give it a try with veggie bacon. Rebekah – I’ll bet it would be delicious with veggie bacon as well. 🙂 I really need to get some vegetarian sushi up here sometime… I know I’ve got many readers who can’t always make the sushi I post. I’ve never heard of bacon in sushi. 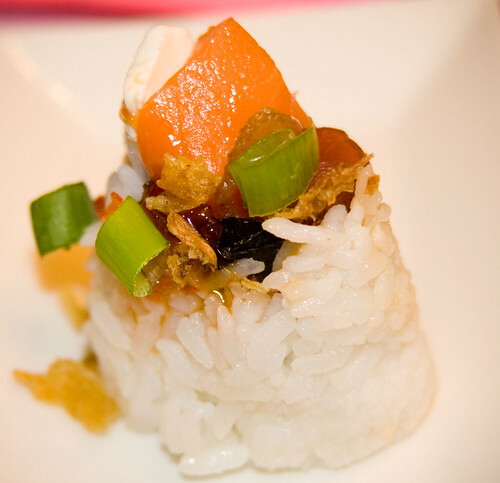 I adore bacon, I adore sushi, so…definitely a must-try! I’m totally with you on the bacon thing. Very interesting…I’ve never had sushi with bacon in it. Someday when I start making my own sushi, I’ll definitely have to give this roll a try. kamaile – You should definitely try making sushi sometime… it’s much easier than it looks! 🙂 If you do try this, let me know how you like it. How is Tex Wasabi’s? If I’m not mistaken, that’s Guy Fieri’s place, right? I think the term he used to describe American-type foods in sushi was “gringo” sushi. Either way, love the blog and am going to try and make a few of these soon! I think this is very good. I’m schmoozing with sushi now. I’m Hungarian and the pork is very popular in my county. I’ll try it.